CM Punk wrestling cards and autographed memorabilia have strong demand from a legion of adoring fans. As with many professional wrestlers, there is little middle-ground when it comes to loyalty. Bottom line, when it comes to CM Punk, you love him or hate him, but whatever way one leans, it still creates demand for his collectibles and merchandise. The first CM Punk cards are in 2004 Pacific TNA. His base card is considered the de facto CM Punk rookie card. An Red parallel is included in the set as is an insert featuring the future World Champion as a member of the tag team The Gathering. CM Punk would make his debut in WWE in 2007, which coincided with his first Topps wrestling cards. Punk appears in both 2007 Topps WWE Heritage II Chrome and 2007 Topps WWE Action. 2007 Topps WWE Action also gave collectors the first certified CM Punk autograph card. His first relic cards were included in 2008 Topps WWE Ultimate Rivals. With regards to CM Punk's autographed material, he has proven to be a very willing in-person signer. He frequently appears at conventions, providing plenty of opportunities for collectors to pick up signed memorabilia. CM Punk's first trading card came when he was part of the TNA talent roster. Having come up through the ranks of independent wrestling and Ring of Honor, this card commemorates the arrival of CM Punk to the proverbial big leagues. 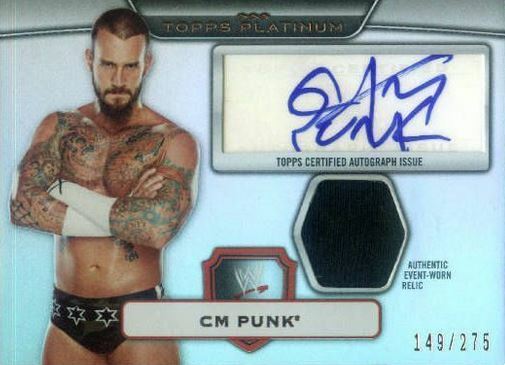 CM Punk's first autographed trading card is, unfortunately, on a sticker. Making it worse is the fact that the sticker is extremely shiny. Its placement also obscures a portion of the photograph and detracts from an otherwise great design with full bleed photography. Professional wrestlers don't usually wear much clothing in the ring. However, they often wear t-shirts before stripping down for the match. CM Punk's first memorabilia cards comes from an event-worn t-shirt. Part of the Ringside Relics insert set, the card features a great design showing a cocky Punk against a brick wall backdrop and chains that frame his name. One of Punk's first autographed memorabilia cards, the card is serial numbered to 275. The card also has three parallels numbered to 99, 25 and 1. Below you will find examples of what an authentic CM Punk signature autograph looks like. This can be used as a first point of reference for determining the legitimacy of autograph memorabilia, but is not a substitute for having your items authenticated by a well-respected professional autograph authentication company. Some of the trusted sources within the sports memorabilia market include the following companies: PSA, JSA, Tristar, WWE and Mounted Memories. Click on any of the images below to view full size photos. The entire signature is printed in capital letters in a stack with "CM" over "PUNK." The letters "C" and "M" are separated by a large over-sized "X" which indicates his allegiance to being straight-edge (clean and sober). The "u" in "PUNK" often resembles a "c."